Amie Kaufman and Meagan Spooner are longtime friends and sometime flatmates who have travelled the world (but not yet the galaxy), covering every continent between them. They are sure outer space is only a matter of time. Meagan, who is also the author of the Skylark trilogy, lives just outside Washington D.C. (though she considers herself an honorary Aussie), while Amie lives in Melbourne, Australia. Although they currently live apart, they are united by their love of space opera, road trips and second breakfasts. You can find them on Twitter at @AmieKaufman and @MeaganSpooner. It would be easy to dismiss Amie Kaufman and Meagan Spooner’s collaboration as merely being a rehashing of Titanic albeit in space. At first glance this is what I thought and refreshingly I was proved wrong. Kaufman and Spooner seem to have discovered a new Science Fiction sub-genre and one that may take the genre to an audience that it has previously struggled to connect with. In doing so, I suspect that they may also have upset many Sci-Fi purists who, on the basis of its strong romantic elements, may disregard the book as a work of fantasy. I don’t agree with this. For me, the questions raised by the story place it firmly within the realm of Sci-Fi. However, the strong feminine perspective will certainly ensure that the story will find an audience amidst the same readers that once gorged themselves on vampires, werewolves and witches. This hefty book of some 374 pages won’t deter avid YA readers. However, its size will probably place it out of reach for shared classroom study and also beyond the appeal of the more reluctant reader. It will serve as a great extension book for students in the middle years; particularly for those new to Science Fiction. The book is expertly crafted and highly engaging, although it does lack the lyrical beauty that would elevate it to the realm of literary fiction. It is a riveting tale of survival set in a delicious setting that captivates the mind. I couldn’t put it down! 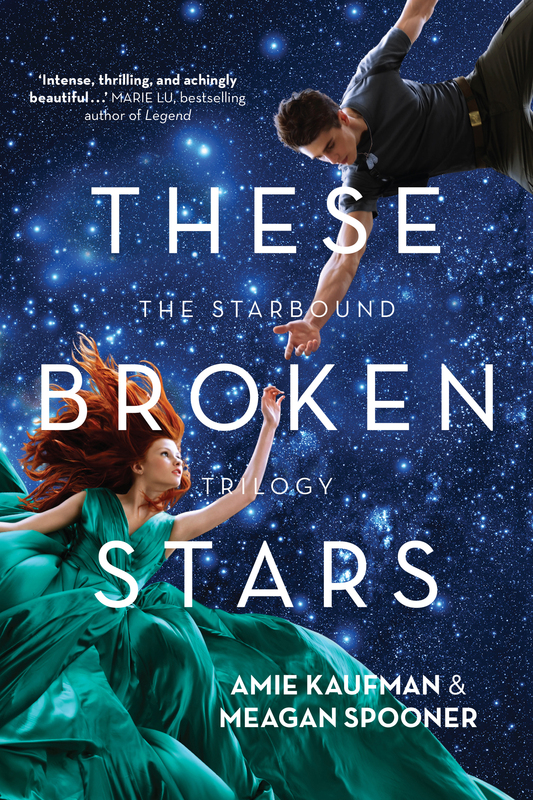 Despite being part of a trilogy, These Broken Stars works as a stand-alone novel. Kaufman and Spooner avoided the temptation of employing the cliffhanger ending. Instead, they rely upon the strength of their characters and world as being enough to tempt audience back to seek out the next installment. When I began this novel, having read the first few chapters, I thought I could predict what would happen after the young and working class war hero Tarver Merendsen met the rich and sheltered young heiress Lilac LaRoux on board the spaceliner Icarus. However, reading on, I was pleasantly surprised by the twists and turns of the story, which ended up a complicated tale of survival, responsibility and love. A terrible accident strands Lilac and Tarver alone on an abandoned planet, and they struggle to survive as they battle their different backgrounds as well as the hidden threats and secrets of the planet.Part of the engaging complexity of the story is the narrative, which is split into three elements. Chapters are presented alternately from Tarver and Lilac’s points of view, and these are intercut with short extracts of Tarver undergoing an interrogation about their time on the planet as a whole, which only adds to the mystery and builds a sense of foreboding about what will eventually happen to Tarver and Lilac while they are marooned. Only when the story has finished unfolding do the full implications of the interrogation questions become clear. These Broken Stars could be used in the classroom from Year 9 and 10, in particular to explore the impact of the split narrative on the reader, and to discuss the different narrative devices chosen by the authors. Narrative structure is increasingly important for students to understand and to be able to discuss confidently in VCE studies. The authors have created a detailed and atmospheric story, with a number of complications that build on the original situation the characters find themselves in. The characters are well developed and interesting, and the world they are marooned on is richly described. This is a challenging read, a novel of substantial size. I would recommend it for older students and for strong readers, particularly those interested in science fiction and fantasy. This story is set in a future where space travel and settlement on terra formed planets is the norm.Two young people from very different circumstances met, Lilac the daughter of the wealthiest man in the universe, a girl without a worry, who has everything she could ever wish for and Tarver, a very ordinary boy from an ordinary family, who joined the army after his brother was killed and became a war hero.Lilac and Tarver are both aboard the “Icarus” the most luxurious starship in the universe when disaster strikes and the ship is ripped from hyper space and crashes on deserted planet. Lilac and Tarver make it to an escape pod, which malfunctions but Lilac is able to reconfigure the wiring to make it detach from the doomed starship and they survive. Only to find themselves on a planet that appears deserted, with no rescue ships forthcoming they search for any way to send a distress signal and survive. This story is told from two viewpoints, we have one chapter from Tarver and then one from Lilac, in between Tarver is being debriefed by someone, so we know that he at least has been rescued. However he does not tell them the entire truth, what really happened on that planet is almost beyond belief. This is a very captivating story and even though there is a love story between Lilac and Tarver, there is plenty of action and I feel it would appeal to both girls and boys, as with the Twilight books.I would recommend this book to students to encourage reading for enjoyment as I really enjoyed this story and I am sure they would also. Jan O’Sullivan, Library Technician, Mooroolbark. Vic. These Broken Stars is young adult novel with an interesting mixture of genres – science fiction, survival story, fantasy, mystery, and romance. It would make a good class novel for grade 9/10 students as apart from the “unsuited lovers” theme ~ Romeo and Juliet- it does have two strong worthy teenage characters. It is the first book in a futuristic trilogy, nevertheless it is fine as a stand alone volume. The story begins on Lilac’s father’s flagship Icarus, which is a spaceship transporting thousands of people on an interplanetary voyage, however when disaster strikes, our two protagonists assist each other to escape in a lifeboat (space pod) and end up being the only survivors from the ship on an abandoned planet. The writing flows well as the chapters switch between the two mismatched characters plus a military interogator (who is grilling Tarver in the near future). Tarver, the young major and war hero, and Lilac the heiress are atttracted to each other at their first meeting but Lilac brutally dashes any idea Tarver might have had for developing a friendship by humiliating him publically. This misundersatnding continues through the first half of the book but this is appropriate as the reader is made aware of their individual points-of-view from the alternating chapters of Tarver and Lilac. Tarver distances himself from Lilac because he comes from a poor background and thinks that Lilac is out of his league and Lilac is afraid her father will harm anyone she becomes close to (as he had her first and only boyfriend sent to off to a war where he was killed.) The separate perspectives is a successful device that enables the development of the two characters when they are the only people present in much of the book. Nevertheless the questions of the 3rd unnamed party helps to maintain the suspense and mystery of the neglected planet, especially when we, the reader, know that Tarver is not answering truthfully. Tarver and Lilac are both likeable characters although Lilac is the one who is most changed by her experience. Despite her coccooned upbringing Lilac shows a lot of resilience and mindfulness after the crash of the Icarus and subsequent ordeal of survival on the mysterious planet. This good characterisation is another positive feature of the book as it is rare to have two such equal character roles. These broken stars is co-authored by two long-standing friends who met in Melbourne and once shared a flat. Amie still resides in Melbourne, but Megan ireturned to the US and lives in Asheville, NC. This comraderie is evident from the authors bogs and especially recent tweets whilst researching together in the US for the sequel to These broken stars . The book works well most likely because of this existing friendship between the authors. 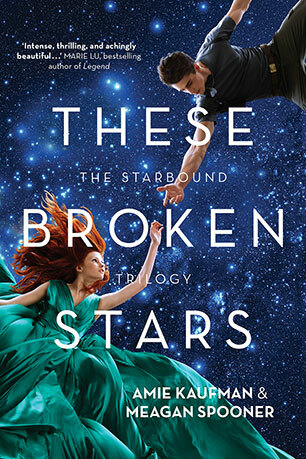 As a teen/young adult Sci Fi novel, These Broken Stars from The Starbound Trilogy is balanced between reality, survival, romantic fantasy, and a pure Sc Fi future. The premise is of a future where mankind's ultimate scientific triumph is the development of warp drive, an archetype of science fiction. Yet at the same time, mankind's drive to dominate and conquer has seen this superb invention subverted to what is basically planetary colonialism & interplanetary war. This premise allows the writers' imagination to present a tale which sees the protagonists become lost on an unknown world when the drive inexplicably fails. The primary setting is aboard the world of an amazing Starship, the aptly named Icarus, the pinnacle of human scientific & technological development. Here our two young protagonists, war hero Tarver & impossibly wealthy heiress Lilac meet, are attracted to each other, & yet both separately realise that their social class is so vastly different that they could never follow this attraction. When the starship fails, the story becomes more than a simple love story. The setting becomes the secondary one of a planet, strange, beautiful, frightening. And strangely alive, yet deserted. There are other stories, one that is darker, the story of a rich man's desire to control everything, including his highly competent daughter; of a planet wronged, and of sentience which cannot be explained by human logic. The narrative is told in post constructionist style, with linear time being subverted. There are three narratives intermingled, first the voice of Tarver, next that of Miss Lilac La Roux, and interspaced between, the voice of the authorities, questioning the survivors in a script which it emerges is being conducted 'post incident'. The transition between voices is achieved smoothly, and the authors provide assistance to the reader with character names at the head of chapters & the choice of different fonts for the different voices. This is a highly enjoyable book, with engaging characters. It is well written and would suit middle High school or even Senior school study, with the opportunities to examine textual form & writing style being very useful. In addition, there is a good mix of science & romance, & Miss La Roux as a highly competent computer engineer provides a strong feminist protagonist. The Adventure element will also appeal. The young age of the two leads will help maintain interest, & the fantasy/spiritual elements will fascinate young adults. There are also themes of class & social justice, allowing some strong classroom discussion. This book would translate well to the screen, where it would probably hit the late Primary school/mid High school market. Although this book works well as a 'stand alone' read, I do hope to read the next two books in this trilogy. Major Tarver Merendsen has earned his stripes that hard way. Young to be a Major but mature beyond his years – a hero. Lilac LaRoux, only daughter of the richest man in the universe - spoilt and overprotected. Both are on board the Icarus, a luxury spaceliner of the LaRoux fleet, when the ship is pulled out of hyperspace. They find themselves in the same escape pod and by virtue of Lilac’s surprising knowledge of electronics; they make their escape and land on the nearest planet – the only survivors. What follows is a story of survival, personal discovery and love.The first in a trilogy from the authors: Amie Kaufman, who lives in Melbourne, and Meagan Spooner, from Washington DC. I loved this book, and the style of writing; each chapter from the perspective of one or other characters. The storytelling has a good pace and the snippets of interrogation at the end of each chapter gave different tone and sense of place, creating tension and drawing the reader into what I anticipate will be a compelling second book.Love stories are often tricky animals, particularly from the point of view of school libraries, but this book has been well written, and the romantic elements are neither cheesy nor salacious. I would be happy to recommend this book to our senior students, and I feel sure it will soon be in high demand.